We at Param Enterprise based in Rajkot, Gujarat, India are the manufacturer, suppliers and wholesaler of Rubber Stamps Kit - Upper Case Alphabet A to Z Dotted line set of 26. This Dot lined Upper Case Alphabet Stamps kit consist of 26 peices stamps of dotted line Letters A through Z mounted on wooden handles is available packed in a plastic box. Stamp image size approximate : 3 x 3 cm. 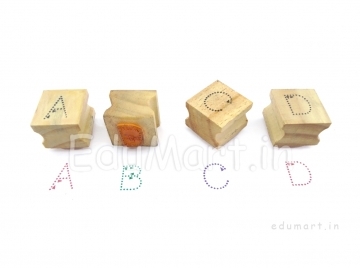 Each Alphabet Stamp has print of the matching letter on the wooden handle, so children can easily find the right one. These Dotted Alphabet letters rubber stamps are manufactured by imported polymer nylon material for sharp and clear impression. You can purchase these Alphabet Stamps with online shopping facility here. Also available red, green, black and violet Ink stamp Pads separately sold for your stamping needs. (1) Prewriting and tracing activity tool : Alphabet Rubber Stamps Kit A to Z Dotted lines set of 26 is a prewriting tracing avtivity tool / Teaching and learning aid for preschoolers or elementary school kids. Pre-writing is learning the skills necessary to begin writing. Pre-writing is an important step because it teaches children the correct way to hold a pencil, how to use a good, firm grip, and emphasizes the use of fine motor skills. Pre-writing and tracing also helps children with the development of hand/eye coordination. The age of your child will greatly affect what they should be tracing. For instance, children under the age of two should just be learning to hold a writing utensil and scribbling. This is because they are still developing the fine motor skills that are required for more complicated motions and are unable to control their movements. At the age of two, children may begin to practice tracing straight lines and perhaps even curves, as the control of their muscles increases. At three, they may begin to trace more difficult shapes. If they master this skill, they will then be ready to begin working on letters. All the letters are made up out of straight lines and circles or semi-circles. So it is the time when the role of this prewriting tracing tool Alphabet Stamps with Dotted lines begins. Alphabet Rubber Stamps Dotted lines are designed to help kids develop their fine motor skills and prepare for writing. These tracing stamps will keep kids busy tracing A to Z Letters. Just print these Dot to Dot Letters Stampers on the worksheet and trace the dotted Letters with crayons. (2) To Teach Letters Sounds Correspondences and Phonics Skills : Letter Sound correspondence is a foundational Language Reading skill for preschoolers or Kindergarten. This Teaching aid Develops reading foundational skills, letter recognition and word building. Have the child collect objects or picture cards / photos e.g. key, cup, pencil, mug etc; then have him or her speak aloud their names, find the initial / beginning sounds of the words, Have the child express the corresponding letter by printing the Letter Stamp and tracing on the worksheet. You can do this activity vise versa. (3) Activity tool for Identifying, recognition, visual discrimination, matching and tracing dot to dot Lettes A to Z with crayons for preschooler. With tracing activity the control of their muscles increases. Rubber Stamps are designed to help kids develop their fine motor skills and prepare for writing Letters. 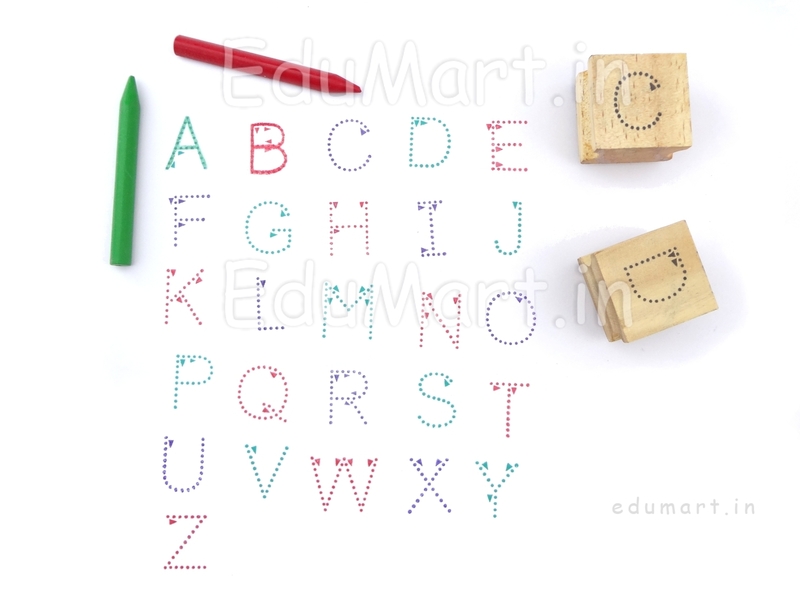 Just print these dot to dot Letters stampers on the worksheet and trace the Letter with crayons. 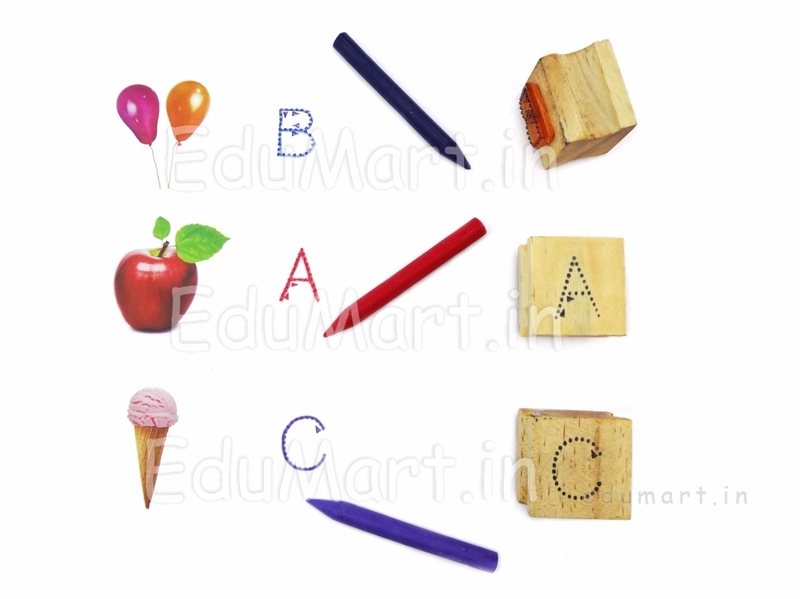 (4) For Creating and developing flash cards of Alphabet A to Z for Kindergarten or Preschool class room. You can order and buy - shop online these dot to dot Alphabet Letters Rubber Stamps here! Please contact us for more customised and personalized stamps.